Forbo's Eternal General Purpose Heterogeneous vinyl sheet flooring can be used wherever people work, learn, play or go about their daily business as the design is suitable for commercial application such as healthcare, schools, office and retail as it is durable, high quality, easy to clean and maintain. All of our vinyl sheet flooring are highly functional and manufactured for top performance. 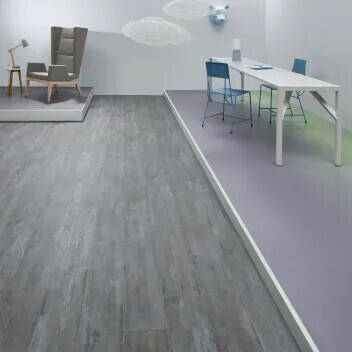 Forbo's Eternal vinyl sheet flooring collection offers designers an extensive range of finishes, all with the same performance specification, including realistic wood effects, stone and abstract designs, a broad palette of colours and some imaginative digitally printed visuals which are designed to inspire. Our Eternal Smaragd sheet vinyl floors are offering you Forbo quality in timeless design. Design that has proven it's practical value across a colourful Smaragd range. Eternal Smaragd will perform under almost all circumstances and is a hassle free choice that will not let you down. 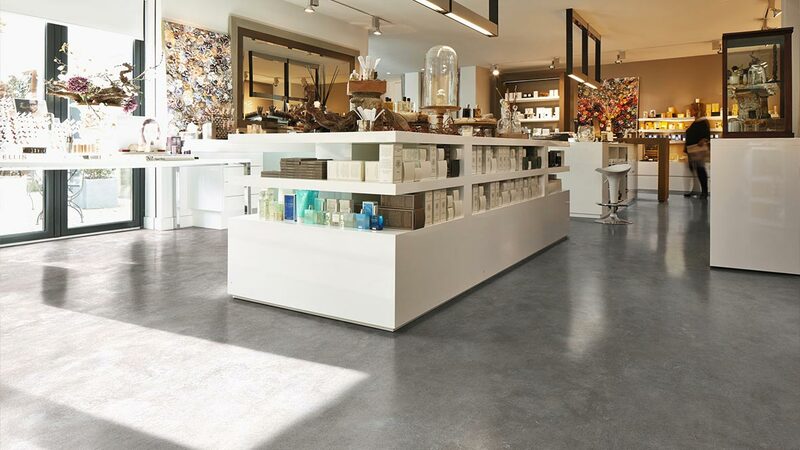 Forbo Eternal flooring is known for its wide variety of designs and outstanding performance in demanding applications. Eternal de Luxe is a great example of Forbo’s unique, premium design capabilities. This new range features fresh wood and stone effects, enhanced by authentic embossing structures that add even more realism to the designs. The PUR lacquering ensures the highest possible performance and longevity of the floor covering. Eternal de Luxe is available in a compact version and a 17dB acoustic version. 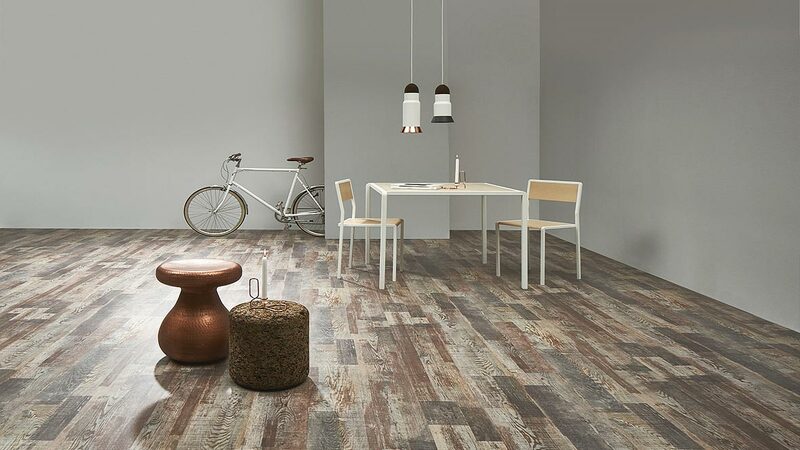 For the Eternal vinyl sheet flooring collection, Forbo's design team has developed convincing, authentic visuals with a unique identity and a natural feel. Eternal's high tech engineering and heavy duty PVC wear layer and PUR Pearl finish are key to the collection's ability to keep its as-new appearance even after years of intensive use. Extraordinary design and exceptional performance – it’s a promise fulfilled across every area of the collection. •Functionality which goes hand in hand with visual appeal. •Accessible design that´s easy to apply. •Wide colour ranges, from soft tones to accent colours – and everything in between. •Outstanding performance in every way. •Mix and match together with current popular interior finishes. 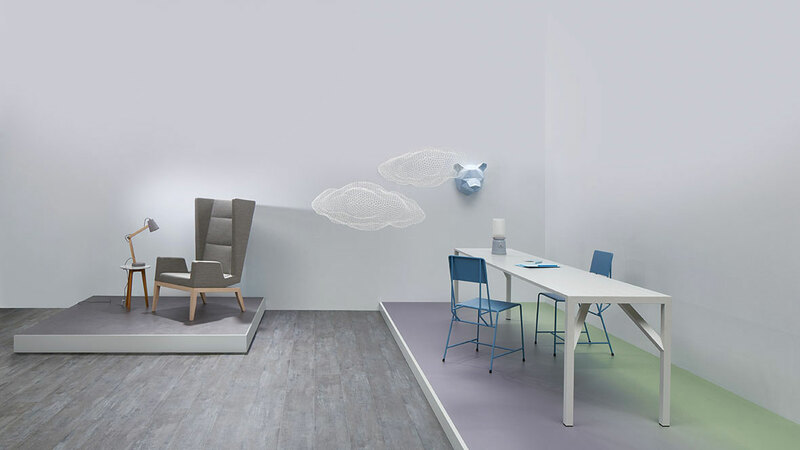 With all these vast design options, Forbo can offer a balanced collection of sheet vinyl products that will compliment any interior from school to offices and health care environments to leisure and hospitality. 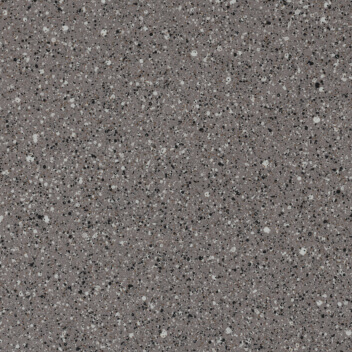 Where to use Eternal Vinyl Sheet flooring? From spills and tumbles of child care through to the large scale thoroughfares in a modern university, there is a common need for attractive, functional products. Eternal has the performance and product properties to satisfy such a diverse range of needs. Bright, stimulating colours contribute to good learning environments. While contrasting colours can help designate different parts of the classroom, libraries or study halls. 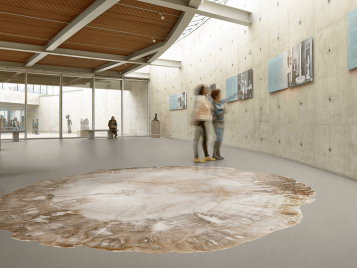 A healing environment needs appealing flooring that adapts to its surroundings. The caring and soothing characteristics of healthcare interiors were kept in mind during the design process and Eternal´s PUR Pearl easy-to-clean, stain resistant, low maintenance surface fits the demanding cleaning regime essential in this segment. All application areas here benefit from a flooring solution with an identity. The floor can be used to communicate branding or maybe zoning within the location. Today offices feature a more relaxed and welcoming feel, to create equilibrium between thought and inspiration. The Eternal range excels in helping you achieve this. By mixing and matching, it enables you to create balanced zoning with functional and aesthetic flooring especially in more practical areas. 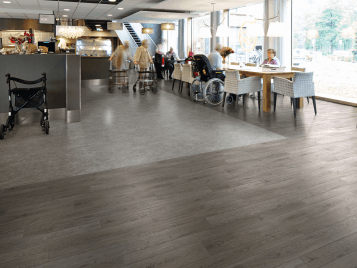 More than ever before when you turn to the new Forbo Eternal general purpose vinyl flooring collection you'll discover a superb combination of state of the art designs in a strong, durable, fit-for-purpose range - whatever your application. 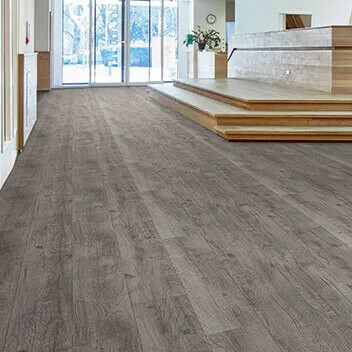 When you’re looking for a flooring solution, you’ll find the Eternal vinyl sheet flooring collection offers you balance between looks and performance. 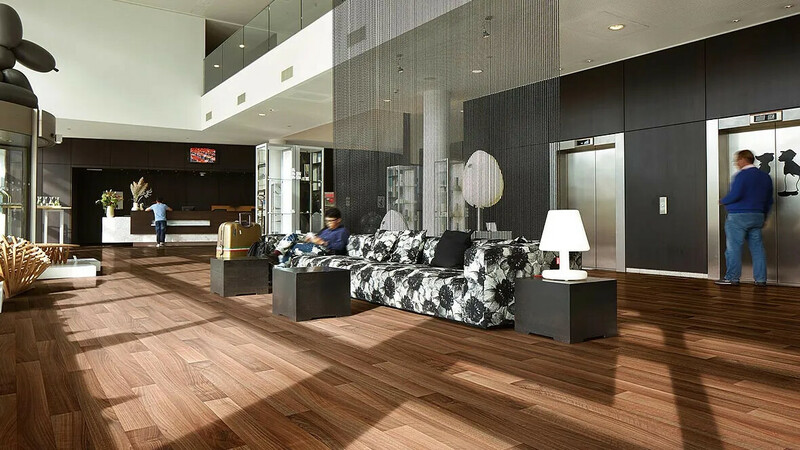 Whether you’re an architect or interior designer looking for a distinctive design, or a facilities manager or contractor seeking a functional solution, the design elements of the Eternal vinyl floors collection can be blended together to achieve the perfect end result. For the new Eternal collection, Forbo’s design team has developed convincing, authentic visuals with a unique identity and a natural feel. Eternal’s high tech PVC wear layer and PUR Pearl finish are key to the collection’s ability to keep its as-new appearance even after years of intensive use. 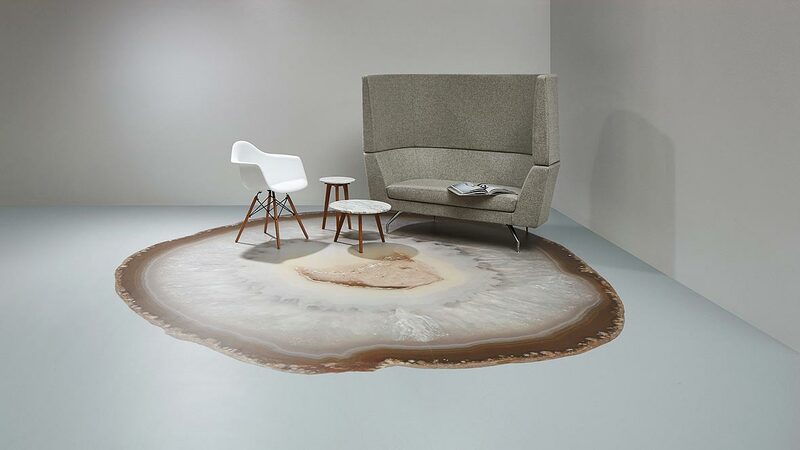 The Forbo Flooring Eternal brand has become synonymous with assured and guaranteed quality. The brand’s performance benefits are clearly recognisable in many installations worldwide. We are constantly striving to improve the environmental profile of our vinyl products through local and international initiatives. For example, we re-purpose our vinyl waste (and that of other flooring manufacturers) to make new products-such as the backing for Flotex and Westbond carpet tiles, which is only one of the reasons Eternal vinyl floors achieves a GreenRate Level A. Green Tag Level A, Phthalate free and produced in a SA8000 certified production facility. • Our general are vinyl ranges contain approximately 40% recycled content in their backing. 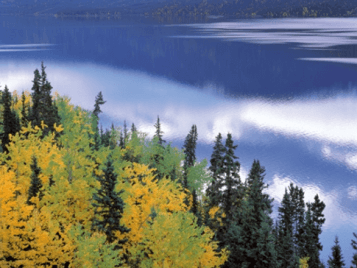 • Of all the electricity used by our manufacturing plant, 100% comes from renewable sources. This means our vinyl production sites are part of an effective environmental management system and achieve ISO 14001 certification. • We use smart material constructions and durable finishes on our vinyl. A micro- embossing technology reduces the need for chemical cleaning and increases the floor's lifespan. • Our Allura Flex vinyl tiles are adhered using tackifier so they can simply be taken up and recycled at the end of their life. Calendared backing, consistent and dimensionally stable construction, colour fastness and unique embossing; it's a combination of these elements along with the PVC wear layer and PUR surface layer treatment that make the Eternal collection stand out from the crowd. Quite simply, guaranteed performance over time is the significant difference. The cleaning and maintenance regime is simple and efficient, maintaining Eternal’s “as new” appearance over many years. The proven PUR pearl lacquering protection technique is used in the majority of our designs. The application technique for the lacquering layer assures an even amount of lacquering both on top and in the deeper areas of the embossing. This matt embossed lacquer layer ensures the highest level of chemical and scuff resistance. The use of a specially developed ‘flexible lacquer’ helps to prevent the surface from scratching and maintains the long lasting appearance. A transparent wear layer, or coloured wear layer where Palette and Contrast demand it, ensures maximum wear resistance and maintains the integrity of the design. A non woven, fully impregnated, glass fleece layer functions as the backbone of the product. It ensures the dimensional stability and allows a lean-development approach. Adding to stability and the high quality is the optimised calandered backing, a firm but flexible and embossed layer allowing easy installation, even if coving or in wetroom applications. The backing layer, which is a substantial part of the product construction, contains 40% re-used content.